For the past few months I’ve been seeing ads for MasterCard PayPass and recently I’ve seen ads for Visa payWave. These are “contactless” IC cards which allow for easy and quick transactions. The only place I’ve seen PayPass at is a local Jack in the Box (yes, I like my junk food) and I don’t think I’ve seen payWave anywhere. Still, Visa claims to have thousands of establishments including big names like McDonalds so maybe I’m just not looking hard enough. Continuing with my Japan theme (albeit a week late), I can say that like many things, IC cards have been available in Japan for a while. One of the major retail card I’m familiar with is Edy, a rechargeable debit card accepted in everything from retail stores to vending machines. Edy is quick, just touch the card over the pad and wait for the pleasant tones of money going out of your pocket into the retailer’s hands. Much nicer than the single beep demonstrated on MasterCard’s PayPass site. I’ve actually had more experience with IC cards for train and subway usage. The Suica card has been available for use on JR trains for years, employing the same technology as Edy. At it’s introduction, the Suica card was a new concept and there was a decent ad campaign to just “touch and go”, referring to the ease at which passengers can get through turnstiles. Recently, the Tokyo Metro subways systems have adopted Pasmo. 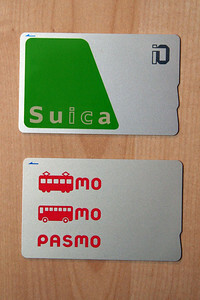 Pasmo, which I found out after picking one up, is completely compatible with the Suica cards. After years of tiny ticket juggling or buying disposable cards, there’s a single system to get around the greater Tokyo area. These cards are really convenient. It’s easy enough to just leave them in the wallet, slide the whole thing over the reader and run on to catch your soon departing train. While these technologies in some ways make for a more secure transaction since you’re always in control of the card, it seems that once a thief has hold of the card it’s a lot easier to get away with illegal transactions. The major credit card companies offer no liability policies for lost or stolen cards as a means to mitigate cardholder worries but that only helps after the fact. The advent of analog and digital recording media brought with it a new kind of problem: dead media formats. Scrolls, tapestries, paintings and books never had the problems that media from the last 150 years have had: lack of reproduction devices, lack of playback devices and life spans measured in decades, not centuries. Last week’s announcement that Paramount and Dreamworks were going to be moving from an HD media neutral stance to only support HD-DVD called to mind all sorts of past format and media battles that have ended in wasted money and discarded collections and devices. Of course there is the legendary tale of VHS vs. Betamax but at least Betamax lived on in professional circles for a couple of decades after losing to VHS in the consumer space. In the early days of video, my family made what turned out to be the right choice and went with VHS. We stayed clear of dead ends like RCA’s SpectraVision, even when it looked pretty high tech in comparison to VHS and had a smattering of Star Trek titles available at launch. We stumbled a couple of years later when we picked up a Disc film Kodak camera, which I cursed at a young age not only for grainy photos but because I would often take pictures including part of my index finger when holding the camera with two hands. Today, Disc film has been dead for more than a decade and I’d have to mail in the negatives to one of a handful of processing facilities if I ever craved reprints. Even scanning Disc film is an issue due to the center plastic ring that makes it impossible to lie the negatives flat. With these and countless other tales of short lived media, I’ve yet to truly commit to a new HD format. While I have Blu-ray playback with my PS3 and thoroughly enjoy watching highdef BD movies, I’ve been a poor supporter of the BD as a format by not actually investing in any discs. Shame on me. I’ve pretty much just rented through Netflix. Given both the number of DVDs in my current collection that often don’t get watched very often and that for those that do get watched it’s usually in the bedroom where only a DVD player resides, I’m hesitant to spend money on a format whose future isn’t wholly certain. Of course, the upcoming Spider-Man High Definition Trilogy looks to be changing my mind on not purchasing any Blu-ray discs.